Large daisy-like flowers with drooping, pink petals surround a large orange button-shaped cone. 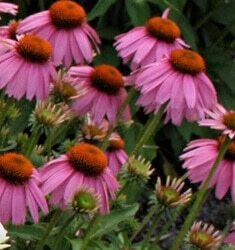 Blooms appear earlier than other coneflower. Brings power blooming to the border garden, capable of over 100 blooms on a mature plant.